These Slow Cooker Red Wine Short Ribs are fall-off-the-bone tender. 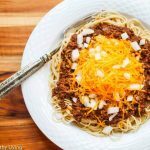 Hearty, delicious and pure comfort food. 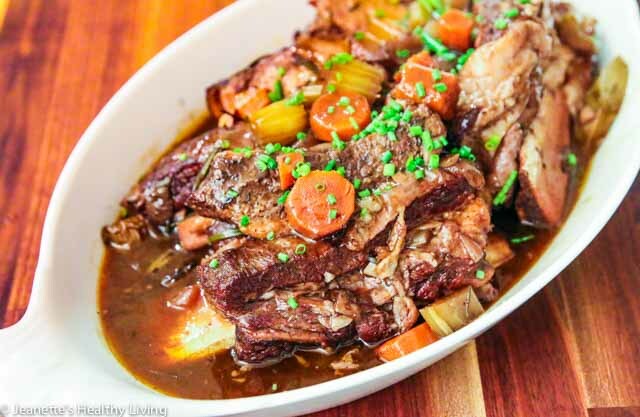 Slow cooking short ribs ensures that the meat will be tender and moist, not dry and flaky. I make these short ribs whenever my oldest son comes home. It’s one of his favorites. My oldest son sometimes orders short ribs when we eat out. The last time, he was disappointed because the meat was dry, not nice and tender as they should be. So, this past weekend when he came home, I made these fall-off-the-bone tender short ribs for him. He loved these! 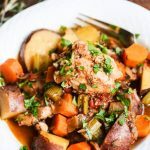 This recipe is based on my favorite Slow Cooker Red Wine Pot Roast recipe that I’ve been making for years, with a few tweaks. My mom used to make short ribs once in a while and I remember how nice and moist they always were. My mom didn’t have a slow cooker, but she did have a pressure cooker, so I think she might have used that instead. 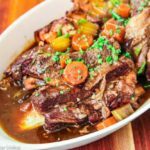 If you’re short on time, a pressure cooker works well for tough cuts of meat, but if you’re looking for a short rib recipe that can cook all day, these Slow Cooker Red Wine Short Ribs will fit the bill.The best way to ensure moist and tender braised short ribs is to cook them low and slow, making the slow cooker the perfect vehicle to do this. 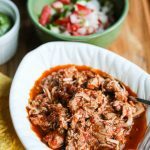 Slow cooking is a great way to cook tough meat, but you need to take a few extra steps before slow cooking for best flavor. First, season and sear the short ribs. These are grass-fed short ribs. 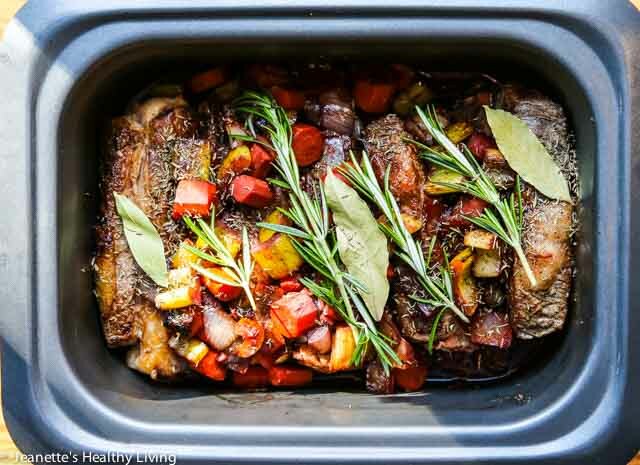 Once the short ribs are nicely browned on all sides, transfer them to the slow cooker and cook the aromatic vegetables in the same pan. 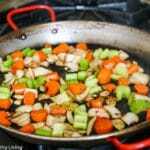 These include carrots, celery, onion and garlic. Next, add the tomato paste and cook a few minutes to deepen the flavors. Deglaze the pan with red wine and reduce it by three-quarters. 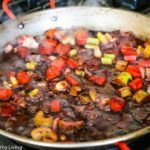 There are many budget-friendly red wines that work well in cooking (and can be enjoyed as regular drinking wines). One of my favorite lines of wine are the 90+ Cellar wines. They are a bargain for the quality. 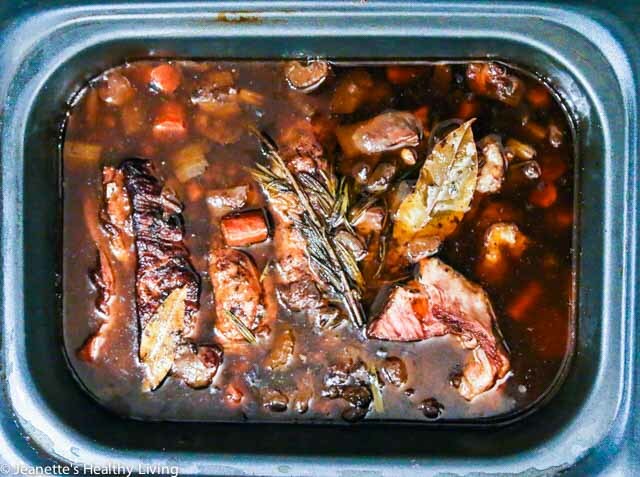 Pour the red wine mixture on top of the short ribs in the slow cooker and add the rosemary, thyme, bay leaves and stock. Cook the red wine short ribs for 8 hours on low. By the time these short ribs are done, they will be fall-off-the-bone tender. There will be a fair amount of fat that has risen to the top of the pot. See below for two ways to remove this excess fat. 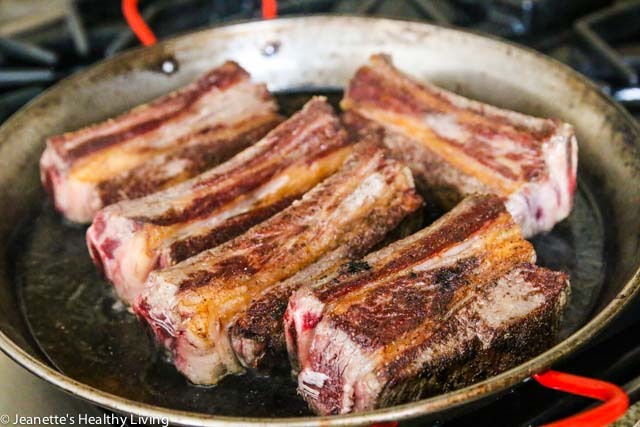 Short ribs naturally have a lot of fat on them. Short ribs can be purchased boneless or on the bone. 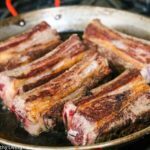 For slow cooker red wine short ribs, I like to use short ribs on the bone because the bones add extra flavor to the sauce. 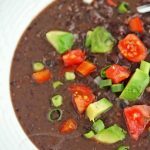 Since short ribs tend to be fairly fatty, you’ll want to remove as much fat as possible before enjoying this dish. trim some of the fat off before cooking if you can. 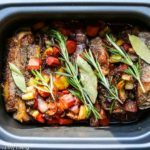 Try to plan ahead and make these braised short ribs at least a day in advance and refrigerate them. Then, scoop off any hardened fat that floats to the top of the container. First, trim some of the fat off the short ribs before cooking if you can. Second, remove as much fat as possible from the sauce after cooking the short ribs. 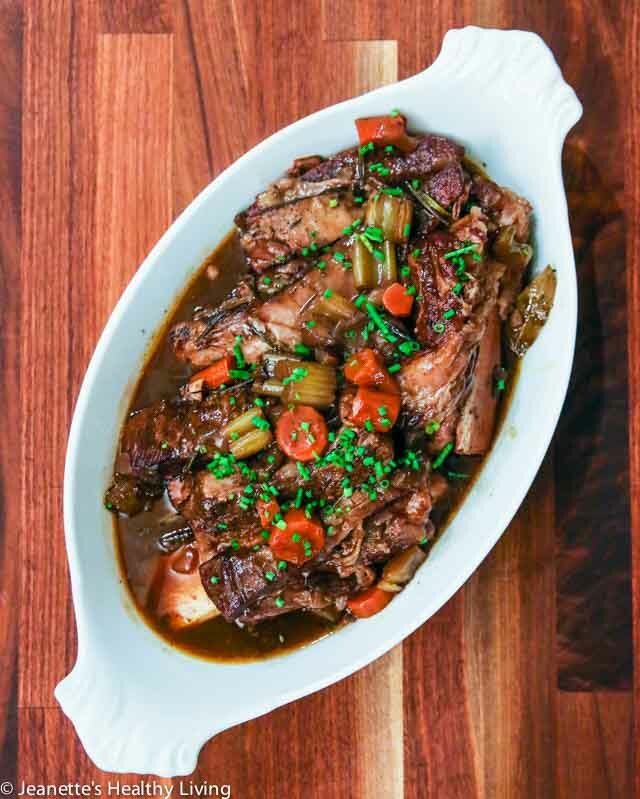 I try to plan ahead and make these braised short ribs at least a day in advance and refrigerate the sauce. 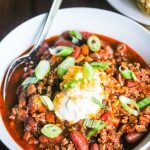 This makes it easy to scoop off any hardened fat that floats to the top of the sauce. 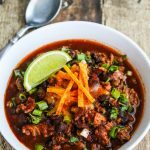 If you don’t have time to refrigerate the short ribs and want to remove as much fat as possible from the sauce, here’s a trick I learned. 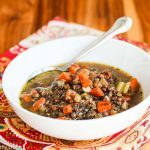 Place a saucepan and a small bowl on the counter. Strain and pour the slightly cooled short rib sauce into a Ziploc bag, seal the bag, and hold the bag over the saucepan. Use scissors to cut off one of the corners of the bag so the sauce pours out into the pot. Once the fat layer gets close to the bottom of the bag, quickly move the bag to the small bowl. The sauce in the pot is now ready to be thickened into a gravy if you wish. My kids love gravy from slow cooker red wine short ribs served over mashed potatoes. These short ribs would also be delicious served over grits. 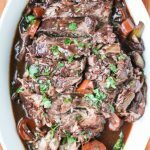 I use a cornstarch slurry to thicken up the sauce from these slow cooker red wine short ribs to make gravy. Heat the defatted sauce to a boil in a saucepan. Then, whisk in the cornstarch slurry (cornstarch mixed with cold water) until slightly thickened. The result is a nice gravy for the short ribs, not too thick, not too thin. If you like your gravy thicker, make more cornstarch slurry and whisk into the sauce. These shorts ribs are super tender, fall-off-the-bone. Thicken the gravy if you like and serve with mashed potatoes. Season short ribs with salt and pepper. Heat oil in a large skillet. Place short ribs in skillet and brown on all sides. 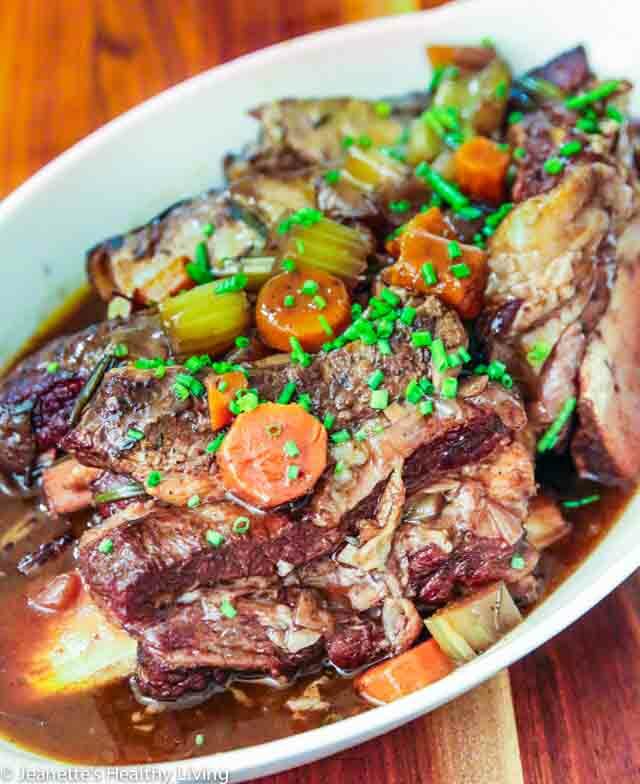 Remove short ribs to slow cooker. 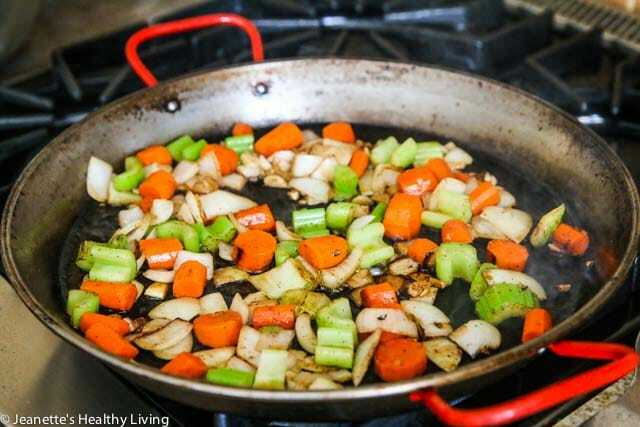 Add onion, carrots, celery and garlic to skillet. Saute on medium heat until fragrant, about 5-7 minutes. Add tomato paste and cook for a few minutes. 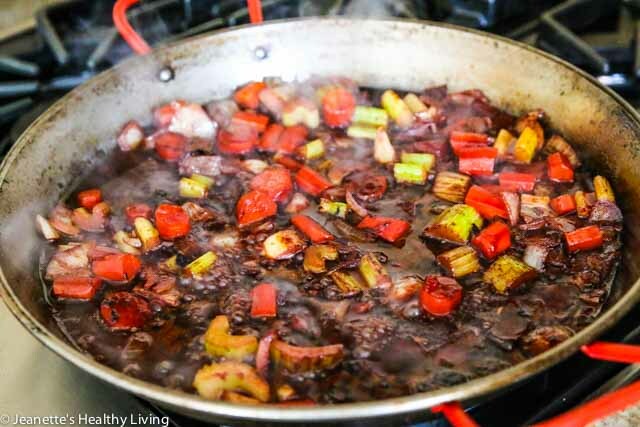 Add red wine, bring to a boil, then reduce heat to medium-low and reduce wine by three quarters. Pour mixture over short ribs in slow cooker. Add stock, rosemary, thyme, and bay leaf. Cook on low for 8 hours, until very tender and meat falls off the bone. To remove as much fat as possible, strain sauce, transfer to a container and refrigerate overnight. If you don't have time to refrigerate overnight, slightly cool sauce, then transfer to a Ziploc bag. Place a saucepan and a small bowl next to each other on the counter. Place bag over saucepan and cut one of the corners of the Ziploc bag. 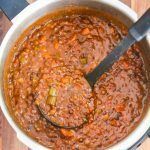 Let sauce pour into saucepan until you see fat layer getting to bottom of the bag. Move bag immediately over small bowl for fat to pour out. To thicken sauce, mix cornstarch with 4 tablespoons water. Heat sauce in pan until just boiling. Whisk in cornstarch slurry and cook a few minutes until slightly thickened. Nutrition facts assume 2 pounds of short ribs (net of bones) and do not calculate removal of fat from sauce. *Nutrition facts assume 2 pounds of shortribs (net of bones) and do not calculate removal of fat from sauce. Marvelous! The meat looks really tender and delicious! 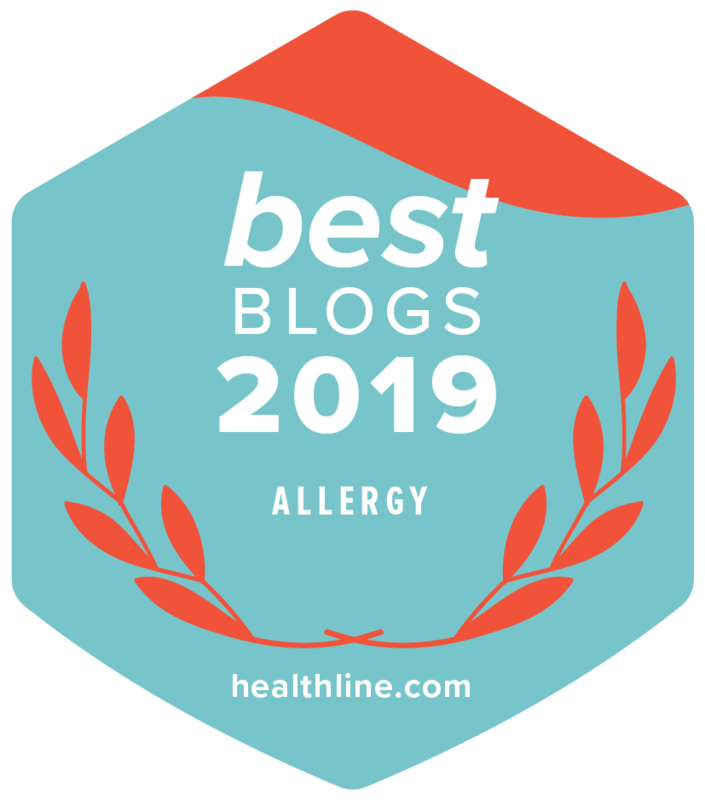 Thanks Angie – these short ribs were super moist and tender! 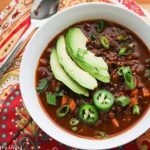 Hi Charlotte, I hope you enjoy this recipe! Why does the recipe call for 6 Cups of broth??? That ingredient was confusing because you didn’t detail when to include it. Was that an error??? ?